It was great because it gathered all my unlistened to podcasts into one easy playlist. I'd get to work, put on the headphones, and hit play on the playlist. I'd get all my podcasts done for the day WITHOUT having to continually touch my friggin iPod -- you know, the old Ronco Slogan, "Set it and forget it." But now I have a 3rd Gen Nano and this playlist just doesn't work -- it will NOT play podcasts one after the other. I have to friggin touch the damn thing even for different episodes of the same podcast. I thought maybe it was something to do with the Nano firmware. So I tried again on my 5th Gen "full sized" iPod and it did the same thing. I've been dealing with this for months - frusterated the whole time. So I thought I would at least check here and see if there is some setting or something that I can do to get this Nano to play through all my podcasts without having to click though menus and all that crap. Please help me to "Set it and forget it!" Kinda weird, but, I've managed my podcasts mostly manually since iPodderX went away. My smart playlist just looks for Genre | Podcast and I manually set a Grouping (which is part of my Smart Playlist as 'not' grouping) Heard. Not exactly 'Set and forget' but has been working for me for literally years. I have something similar, only I replaced "video" and "movie" with "mpeg-4" and "quicktime". I also checked "Match only checked items", so I can selectively leave out certain audio podcasts. I do the latter, because I also have a smart playlist with podcasts I have listened to, which I use to delete episodes manually. If I want to keep something, I simply uncheck it after I've sync'ed my 2gen iPod nano. I also have a similar smart playlist for video, which are all podcasts which have a kind that doesn't contain "mpeg-audio" or "pdf" or "aac". OK - looked at my playlist and it is set-up almost exactly the same as you show here (the order of the condition are a little different). So I get a nice playlist of only audio podcasts that have never been listened to. BUT here's the problem: I go to Music --> Playlists --> and then if I click play with the playlist selected, the first item in the playlist comes up as if it is going to play but NO audio - almost as if all I did was select it. OK so then if I go ahead and open the playlist and select the first podcast at the top, it plays. I get audio. But once that podcast is done, it DOES NOT move onto the next podcast in the list. The stupid thing just go back to the playlist. THIS is what is killing me. So it's a black 3rd Gen Nano which I sync with my Mac Mini, OS 10.4.11, iTunes 7.whatever is the latest. Is there a setting on the iPod I need to switch?? It might be a glitch with the iPod software. I would try resetting the iPod through iTunes. Of course it could just be a model-specific issue with the 3G Nano ... in which case you might have to wait for a firmware fix. Try telling it to Repeat All in the Nano settings. Tried it . . . and if I select the playlist and hit play, I get the same behavior . . . the first item in the playlist appears to go into "play" mode, but it shows a 0.00 duration song and nothing happens (no sound, no movement, etc.). If I then open the playlist and select the first item and then hit play, it plays through the first item and then simply repeats that item again and again. BOOYAH!!! I got it!!! Halle-freaking-lujah! So I started tinkering with settings here and there. There appears to be some weird glitch -- IF I have my "Shuffle" setting to anything but "OFF", then I can't play a playlist of podcasts. IF, however, I set the Shuffle setting == OFF, this playlist works!! Now that I have it figured out, I'll just have to switch shuffle on and off between podcasts and music respectively. Wait -- did I just create a new problem? Oh well . . . at least I can listen to my podcasts again. I have similar behaviour with my Shuffle, which I use exclusively for podcasts. It will only play podcasts if the shuffle switch is in the 'off' position. If 'shuffle' is switched 'on', it just flashes the yellow led at me. It took me a while (and a few factory restores) to figure out what was going on. Seems like strange behaviour to me, and not at all obvious or user friendly. I had a shuffle for a long time before I got these screen iPods. This was the behaviour my old (512) shuffle did -- but I also had music on it, so if I switched to shuffle, it simply wouldn't play any podcasts. I'm thinking that Apple did this on purpose -- but you are right, discovering this behaviour is not obvious nor well documented. 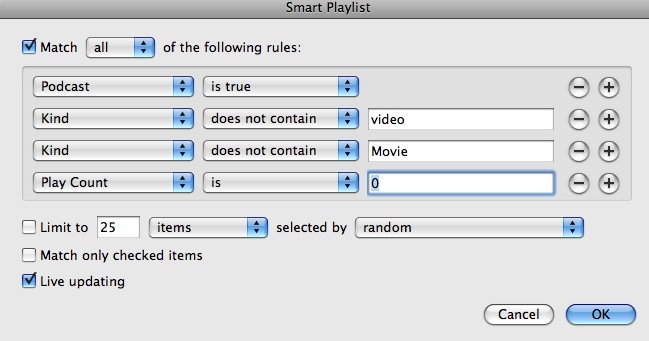 And...if that isn't enough (hijack thread coming) smartplaylists for Podcasts do not work for AppleTVs and FrontRow... I wish I could fix that somehow.